It is easy to believe that mechanized inventory control is inextricably tied to the computer revolution. 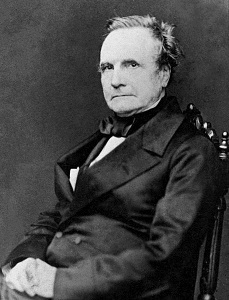 Computers themselves evolved partly from the advanced mechanical calculator designed by Charles Babbage in the 1820s, however, and theoretical forbears of modern checkout systems existed at least as early as the 1930s. Forty years passed between these forbears and the advent of standardized barcode reading for inventory control. During these years electronic technology caught up with the projects and dreams of specialists in the field of inventory control and what is now called Point of Sale. In 1932 a Harvard University Business Administration team led by Wallace Flint came up with the first known automatic checkout/inventory control design. Their system never got further than Flint's masters thesis, but it was in some ways superior to actual systems that see action today. The HUBA team's system would work using punch-hole cards picked out by consumers. The cards would correspond to catalog items. The idea was that a machine would read the cards and pass the information over to the storeroom, where the appropriate items would be mechanically removed and moved by conveyor belts up to where the customer could pick it up. Machines would then create a customer bill and update inventory records to reflect the purchase. The planned system was too expensive to go into use. The next big advance came between 1948 and 1952. In 1948 Bernard Silver and Norman Woodland, two graduate students at the Drexel Institute of Technology in Philadelphia, built a reader that scanned paper marked with ultraviolet light-sensitive ink. Unfortunately this prototype was too expensive and unreliable. Woodland left Drexel and devoted himself full-time to working out the bugs of the barcode idea. At first he simply took Morse code and turned the dots and dashes into narrow and wide lines. He simultaneously came up with the idea of using a different format made of concentric circles, like those visible on a tree stump, so that the code could be read from any direction. In 1949 Woodland and Silver patented their concept. To push his and Silver's idea and to raise funds, Woodland got a job with IBM in 1951. The two constructed another prototype that used a very powerful light bulb in combination with a photo-multiplier tube designed to read movie soundtracks off film. They hooked photo-multiplier tube up to an oscilloscope to see whether their device worked as intended. It did. It was enormous and because of the powerful light source, hot and dangerous, but it worked. Now there were two questions: how to make the device simpler, smaller, and cheaper; and how to apply the electronic signal that it produced to commercial applications. The first question had no answer at the time because lasers had not yet been invented, and there was no obvious replacement for the powerful bulb that could bounce enough light off marked paper for the photo-multiplier tube to get a reading. The search for an answer to the second question was also stymied by a lack of technology: computers were rare and expensive in the 1950s, and without a way to do something with the read data, Woodland and Silver's concept had no advantages over inventory control and point of sale performed by unaided humans. Despite these problems, Woodland and Silver pushed on with the idea that had consumed their time for the past four years. Meanwhile, in 1952, their patent had been granted. The possibility of great success hung in the air. But a consultant hired by IBM correctly pronounced that there was simply no way to make the partners' idea work with current technology. Accepting this as the truth, the partners sold their patent to Philco in 1962. They had made at least two significant advances forward by designing a reader and creating a workable barcode format, but their machines, had they ever gone into production, would have proven unimaginably more expensive than human workers performing the same tasks. At about the same time as Woodland and Silver were selling their patent, David Collins of the Sylvania Corporation had access to a computer and an idea about automatically identifying railroad cars. His design used reflective stripes and a much less powerful light source than the Woodland and Silver model. The system worked well and railroads began implementation, but computers soon proved that they were still too expensive and Collins was frustrated with Sylvania's insistence on restricting his technology to the railroad industry, so in 1967 he left Sylvania to found Computer Identics. 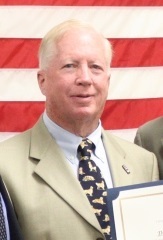 At Computer Identics, Collins merged his technology with newly affordable laser technology. Lasers made readers cheaper, safer, smaller, and more accurate. Readers also got a new name, "scanners", because a laser reader would scan its laser beam across the coded surface many times a second. The incorporation of lasers was barcoding's first major leap forward. In 1969 barcode reading turned profitable when General Motors and New Jersey's General Trading implemented Computer Identics products at their plants. The news did not go unnoticed. Radio Corporation of America (RCA) jumped into the pool in 1970, teaming with Kroger grocers to conduct research on barcoding. 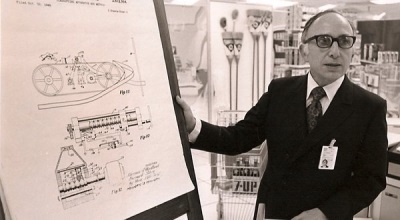 Soon America's leading grocers created their own research and development team, the UGPCC (Uniform Grocery Product Code Council), a consortium that worked on both barcoding hardware and symbology, the barcode language that scanners would read. The UGPCC essentially created a competition among America's largest business technology developers, a race to see who would be the first to create an acceptable barcode technology and symbology. Amid this mounting excitement, and in response to RCA's challenge, IBM decided to draw out its ace in the hole: Norman Woodland. At the time RCA was pushing a concentric circles ("bull's eye") code format to the UGPCC. Though the bull's eye offered readability advantages over bar codes, these advantages had been reduced by laser scanning technology, and the bull's eye production technique tended to produce asymmetric smears that prevented the bull's eye code from being read. Woodland decided to go with a barcode instead. IBM's team, including Woodland and other IBM barcode patriarch, George Laurer, won out the competition against RCA. Their design was the Universal Product Code, the UPC, adopted by the grocery industry in April 1973 and overseen by the Uniform Code Council (UCC), a creation of the UGPCC. Standardization was barcoding's second major leap forward, since it finally pushed barcoding technology over the line that separates concepts seen as unprofitable from those that are seen as profitable. Barcode scanners went into field use in 1974. The first item ever sold with the help of barcodes was a pack of Wrigley's gum. Point of sale applications of barcodes were only the tip of the iceberg. The advances that the great race of the early 70s had made in barcoding affordability and standardization allowed for the profitable use of barcodes in inventory control as well. Barcode standardization was one of the most significant events in the entire history of logistics. With every major grocer's studies showing that barcoding would lead to great savings in just a matter of years, and with computer prices coming down to affordable levels, the door opened to a great surge forward - to an information technology that would tie not only businesses, but entire industries together. The sheer fact of having had to come together and agree on a barcode standard pushed individual grocery companies into closer cooperation. The door opened to a single electronic language of inventory control, shipping, and sales. By the 1980s the first inventory control computer programs that could run on a PC were starting to see use. But that is another story. As we have said above, the revolution that was barcode standardization is still not played out, and we do not mean that specific technologies such as RFID are on the rise, but rather that the possibility of a single standardized electronic language that represents every inventory item in the entire commercial world and allows companies to communicate in a standard and efficient way still hangs in the air. The implications of the barcode revolution will be seen by the present generation to have been more momentous than ever expected. Written by Anton Dolinsky for Almyta Systems. When author's and Almyta Systems names are mentioned, the reproduction is freely allowed.